Ever since I read The Madman’s Daughter, I vowed I would read anything that Megan Shepherd ever came out with. 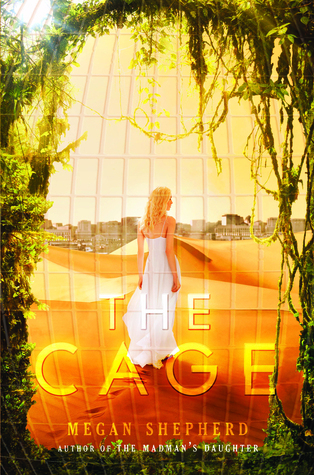 The Cage is about 6 teens that were taken to a human zoo and kept in a cage by the Kindred, who are like alien-human things. The cage has different environments that are supposed to make the teens feel at “home” on Earth. Tundra, farm, ocean…The Kindred have solid black eyes that instantly reminded me of the demons on Supernatural, they keep their emotions cloaked, and hard metal-like bodies. The 6 that were removed from their earthly home are Cora, Lucky, Rolf, Nok, Leo, Yasmine (who dies in the beginning) and then Mali, who joins the other 5 later on. The Kindred require the 6 of them to uphold 3 rules: Solve the puzzles, Stay healthy by eating the food provided to them and sleeping, and procreate by the end of 21 days. WHAAT?! They have all been paired up in terms of procreating-Lucky & Cora, Rolf & Nok, Leo & now Mali. One of the Kindred seems different than the others-lets his emotions slip sometimes, tries to be a friend, and that is Caretaker, Cassian. Cassian, for some reason, pays more attention to Cora, and the others start to catch on. Cassian is tall, bronze, and handsome. LOL! But really, he’s like an alien, so I’m not so sure about all that, but there is definitely such an attraction between him and Cora that midway through the book I just wanted them to kiss already and fall in love, even though he isn’t hardly human…what is wrong with me?! On to some of the characters. As with The Madman’s Daughter series, Megan’s character development is awesome. None of the characters were flat, but they weren’t over-described either. I really liked Cora. She is headstrong and brave, but she did really tick me off with the whole escaping talk. Like, even if you can escape, you don’t even know where you are, so how are you going to get back home?? I really liked Lucky as well. He was funny and sweet. Rolf was cute at first, being all nerdy and smart, but started to become a jerk. And I hated Nok from the beginning. The world that the author created was really creative and innovative. I liked the idea of a environment that can change with mind control. The Kindred claim the 6 have been placed in this cage for their protection and all the Kindred want to do is see them thrive in the environment while they watch and research how they act and develop. Between the changing scenery, the shadowy black figures constantly watching behind the windows, headaches and lies, the 6 captives begin to go crazy. All Cora wants to do is get out and return to her home on Earth. The ending really threw me. I totally did not see that coming. I need book 2 ASAP!! You First is a very motivational journal that seems like a self-help book mixed with personal prompts. First impression, it has a gorgeous pink and purple cover! 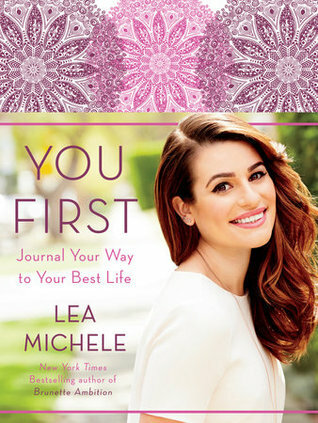 I fell in love with Lea Michele from Glee and was very excited to see a journal by her! I enjoy journaling but can sometimes feel stumped about what to write about that isn’t boring. You First enables the reader/writer to reflect on their life and really dig deep to figure out what you can do (or not do) to have your best life. It’s broken up into 4 categories, with section prompts and thoughts for each: You, Ambition, Relationships, Happiness. For example, there are prompts about what type of coworker you may be, and maybe you discovered some things to work on in your life to have a more enjoyable workday and relationship with colleagues. There’s also a section on exercise, which allows you to decide what you want from exercise, how you want to feel, and how you actually feel when you accomplish a workout. There is a space for a food journal, where you record what you’ve eaten, and there are food challenges to try different diets and record how you feel. I look forward to finishing out the rest of the journal by taking my time with the prompts and really reflecting on my answers. I was provided a copy of You First via Blogging for Books in exchange for my honest review. What do you do when you are pretending to like someone to make other someones jealous but it ends up not being pretend?! “P.S. 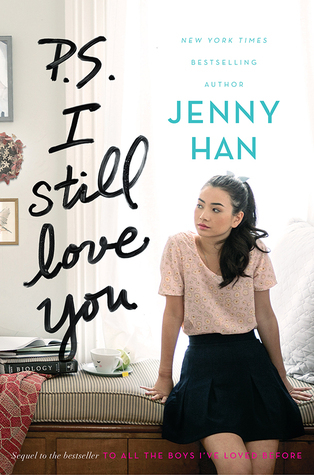 I Still Love You” is the sequel to “To All the Boys I’ve Loved Before” and it is just as sweet, charming, and heartwarming. I love how all of the characters are developed in such a way that they seem so real and I can actually picture them in real life. The second book in the series picks up with Lara Jean coming to the realization that she really might *love* Peter, but things kind of ended horribly. I enjoyed watching their real relationship unfold in this book. Peter and Lara Jean fit so perfect together, they are just adorable! Lara Jean is quirky, lovable, loyal, and also relatable to me. She seems like a genuine kind-hearted person that I would want to be friends with. She discovers some things about herself and really grows as a person, especially with the way she handled the hot tub scandal. The family dynamic between the 3 sisters and their dad is really special and one of my favorite things about this duology. In the first book I was rather annoyed with Kitty, she was a bit over the top, but I LOVED her in the second book. She’s the ultimate little sister. The dilemma with this book was having to decide if I was Team Peter or Team John Ambrose McLaren!! Peter really made me mad at times, like when he was protecting Gen and such, but he is just so darn charming and lovable that I couldn’t completely write him off when John came into the picture. John is smart, sensitive, and perfect gentleman, but there’s just something he doesn’t have that Peter does. If you’re looking for an adorable contemporary series to read, I highly recommend this duology! It’s fun, sweet, and lovable.